Yesterday I have navigate thru some of the most popular reference managers available for researchers. Some of them are private license other open source and even something on the middle. Their functionality, user friendly interface and operationally vary as much as your own topic of research. Nevertheless, versions reviewed were more laptop base than mobile. As a social sciences PhD 3.0 I need ultra mobility, this means working on the road and get everything in one place with the less work from me as possible. Cloud base software is the last trend and the last tool we have in order to have our files and work available on a few clics. This really helps! But… is it enough on the era of the hyper-connectivity? We learnt to work with social networks and even I would risk to say that we don’t know how to work without them anymore. This has an impact on our production, and as well on the tools we may use. As on the previous post, some reference managers have this social option, in fact all of them by now. EndNote with the Web of Science and its researchers space, where we can share documents and create kind of communities; Mandeley with its groups; Zotero in communities… But…is there anything more portable, and social, than a cellphone? I work a lot with my iPhone. It’s like an academic prosthetic extension of me (such a big statement, wow!). Fieldwork, video & foto capture, audio, interviews, writing, communicating… bufff I use it for a lot of things, and obviously on the road. So, if I am working on something on my iPhone I wont it on my Mac as soon as possible to continue with my work from where I left it. Integration of platforms and synch. Here is where apps come to play. There are quite a few available on the Apple Store, and I was not sure about how to compare. But reading their descriptions and some of the comments / rates help to have an overview of their productivity. I’ve got frustrated as I couldn’t find any native Zotero app, even that we can use a third party to manage our references from our mobile devices. Mendeley was available for all of idevices, instead of EndNote, just available for iPad… (deception!) I include my reference on the road catcher: RefME. I strongly believe that it is a good to catch some references while visiting libraries, bookstores etc. In addition let you save your notes and references very easily! Mendeley is a free reference manager and PDF reader designed for researchers, students, and knowledge-workers. RefME is the world’s #1 tool for accurately automating citations, reference lists and bibliographies, on mobile and web (RefME.com). 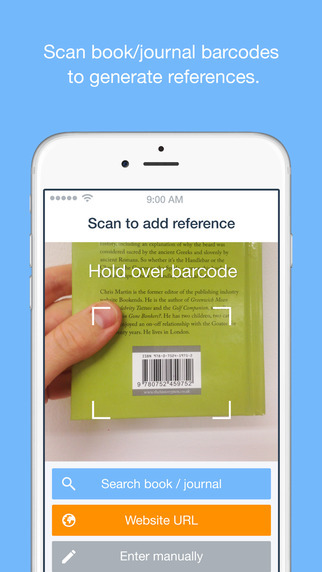 – Generate references by scanning book or journal barcodes using your phone’s camera. – No barcode? Search by Book/Article Title, ISBN, ISSN, DOI or URL. – Referencing a website? Simply paste in the URL or use RefME.com, which syncs with the app and is perfect for websites. – 7,000+ supported referencing styles including Harvard, APA, MLA and OSCOLA, as well nearly all university-specific styles. – Add notes to your references, both in the app and at RefME.com. – Collaborate with others by inviting team members to access and edit any project. – Export via Email or Evernote using the app. – Cite webpages directly from Safari, using the App Extension. – Send your work straight to MS Word, EndNote and more from RefME.com. Papers is your personal library of research on the go. Find, read, organize, share and sync your research papers – anytime, anywhere! • Revolutionize how you collect, organize, and read documents. • Search simultaneously from 20+ repositories, including PubMed, Scholar and ArXiv. • When you import papers into your library, Papers lets you organize them in collections and read, annotate and freehand draw them in glorious full screen. • Import Word, PowerPoint, and other document files to your library and organize them just as easy as your PDFs. • Automatically find and download the PDF for references you import from search engines, when the full-text is available! • Papers now also optionally lets you store and synchronize your library on Dropbox to your Mac, PC and iOS devices. • Create shared collections and add content to your Reading list, also accessible via your web browser. Collect, collaborate, create from anywhere with Thomson Reuters EndNote TM – the world’s most popular research management tool. With flexible tools for searching, organizing, sharing research, and creating bibliographies, the EndNote for iPad app extends your ability to stay on top of cutting edge research and connect with your EndNote library on the go. EndNote enables you to easily view, edit, organize, and share research material on the iPad. By syncing your research library across iPad, online, and desktop, you increase the power of EndNote by gaining seamless access to your reference library from multiple devices and platforms. Apple Store was checked on January 10th. Portuguese Store.